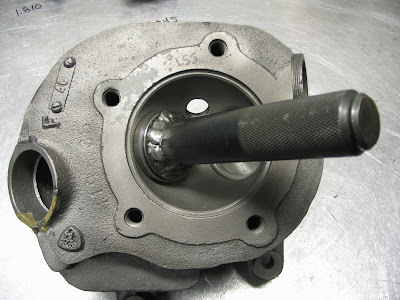 As I mentioned previously, one of the items I would like to cover on my blog this year is installation of big intake valves in a set of Knuckle heads. If you are dealing with stock heads, it is quite likely that you will find good reason to give the exhaust seat inserts attention also. 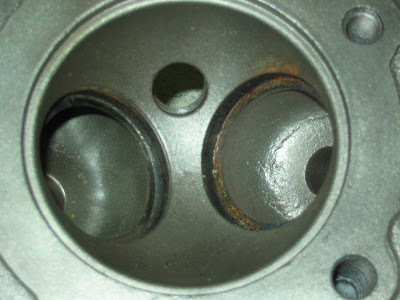 Sometimes the stock exhaust seat is simply sunk too deeply from multiple valve jobs. Often the seat will be pitted so badly as to be unusable. But even if those two items are not an issue, you may want to consider replacing them because they have become extremely "work hardened" from 60+ years of use. While this extreme hardness is not an issue while in service, it makes the seats very hard to work with. Modern seat cutting equipment will invariably chatter, and stone type seat grinders will require lots of time and constant dressing if there are any misalignment issues to be corrected. 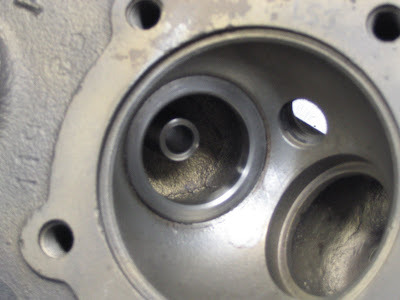 So, as part one of this series on installing bigger intake valves in a Knuckle, we will look at replacing the exhaust seats, though if you are planning to use stock size intakes, the same procedure can be used for those seats. 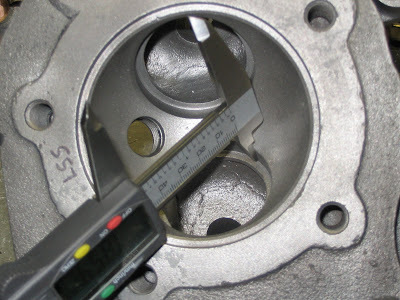 ABOVE: Once the seat recess has been cleaned, carefully measure the bore in multiple places to determine how much press fit the new insert will have. You want a minimum of .004" interference, though I prefer .005"-.006". 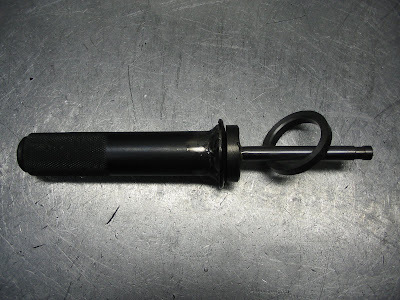 ABOVE: A home made tool will work for seat installation. This one is made using an old valve with a collar welded just below the face to keep the new insert centered, and a piece of scrap for a handle. Shown here with new insert not seated on collar. ABOVE: Tool with new seat insert seated on collar. A "dummy" guide will have to be installed temporarily in head to keep everything aligned so that the seat goes in straight. You can always use your old guide (you didn't throw it away did you? ), sanded down a bit so it is only about a half thousandth press in the head. ABOVE: Prior to actual installation, put the head in your oven at 500 degrees (that is the head in your oven, not your head in the oven) and the seat insert in your freezer. If the head is clean, it should not stink up the kitchen, but if it isn't and your wife catches you, you may want to go back to putting your head in the oven. Unlike with an aluminum head, even with a heated head and frozen guide, you will have to use moderate blows with a hammer to install the seats. ABOVE: Here is the head with new exhaust seat insert installed. Now you can remove the dummy guide and proceed with the valve job, which will be covered in a future post. 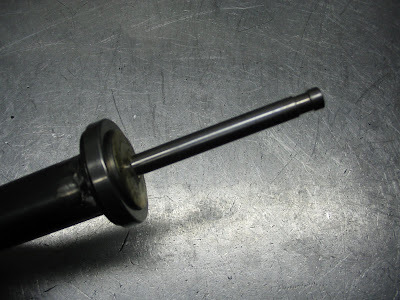 One last thing, if you are having trouble finding suitable valve seat inserts, you can follow the link at the bottom of the left hand column of this blog to my eBay store. I will generally have what you need in stock. This morning there was another earthquake in Haiti. It measured 6.1 on the Richter scale; no small thing. Americans, as is standard operating procedure, are in the process of providing relief, both in manpower and charitable giving. Here is a reason to help that you may not have considered. He reminded us that this was written by Paul at a time when Jerusalem was suffering from famine. The other churches were taking collections to aid their brothers and sisters of the Jerusalem Church. Our church is member of the North American Baptist Conference. It just so happens that within the NAB there are over 30 churches and schools in the affected region. As of last Friday, among Haitians with NAB ties, there were 450 families homeless and 85 confirmed deaths. With another earthquake today, certainly those figures have not improved. Ours and other churches within the NAB have been taking special collections to go to our brothers and sisters of the Haitian NAB Churches, and I feel confident that the moneys will be used wisely. My guess is that if you check with your local church, they are doing something similar. With such a clear Biblical pattern to follow, what's stopping you? Visiting. From my point of view, the simple art of visiting may be on the verge of extinction. When I was a young boy, visiting was commonplace. You might even say it was a popular form of entertainment. The normal time for visiting was on Sunday afternoon. Whole families would travel to "visit" friends or relatives. Once everyone was settled in, the visiting would commence. Just plain good conversation. Hours of it. And believe it or not, I was normally perfectly happy just sitting there and listening to the "grown ups" talk. I was happily reminded of this old custom earlier today (Sunday), as I traveled to my older brother Bill's home for a visit. Bill, his wife Carol and I had a good old fashioned visit. It went on for about four hours, during which time we covered everything from recent family events, to reminiscing about our childhood, to our faith and our churches. Although I have somewhat of a reputation of being a man of few words, I believe I held up my end of the conversation. All in all, a very pleasant afternoon. As is so often the case, though, this visit was not just a part of a normal pattern of events. It was brought about by Bill's impending surgery. You see, Bill was diagnosed with stomach cancer just before Christmas. His doctors believe that the cancer is completely contained therein, and so on Tuesday they will remove his stomach. I have to say that I find Bill's faith inspiring. He says that he knows where he is going, so he just looks at it as another of life's adventures. For those of you who are Christians; please take a moment to pray for my brother Bill. There must be something in the water in Sweden, and whatever it is, it is pretty potent. And not only that, but it evidently has been in the water for a long, long time. My grandfather on my Dad's side came here from Sweden in the very first years of the 20th century; my grandmother's parents a generation earlier. Apparently they passed the disease on to me. Whatever the cause of this "bug" it manifests itself by causing the infected person to undertake totally illogical projects such as drag racing with decades old technology. 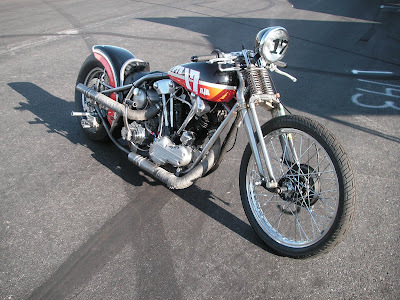 When I began drag racing back in the mid 1980's, the Knucklehead engine design was over 50 years old, and the last one had left the factory 40 years earlier. It looks as though my Swedish friend may have contracted an even more severe case than what I suffered through, since he is currently racing with the same engine design, which now is approaching its 80th birthday. The 120 cubic inch Knuckle weighs in at 432 pounds, and as can be seen here, the 6 inch M&H slick with no wheelie bars makes for some great photos! What a great looking bike! First day back at work for the new year of 2010! For many, not such a day of excitement, especially if you don't care for your job. If, however, you are self employed like me, there is a better chance that you are doing work you like, so the fresh new year of work ahead should make for a good day. But I must admit, as I came in this morning, it was with anything but an attitude of expectation. In fact I was not looking forward to it at all, and I knew the one reason why. Taxes. And not even the amount of the taxes; after all, I have been paying in estimated taxes all year, so its not as if there is a "big hit" coming other than the normal one that comes with the 4th quarter payment. No, the discouragement was due to the vast amount of time that will be spent preparing for taxes. First there is inventory. Every part I have in stock had to be counted. Now the cost of all those parts has to be looked up and recorded. Hours upon hours will be spent going over records to be sure every receipt was properly categorized and then entered into the correct space on so that some time before April 15th an accountant can spend less than an hour transforming all of my figures into something that only he and the IRS can decipher. I estimate that I lose at least a week of production every year preparing for taxes. In other words I work a full week (or more) with no pay just to determine how much the government will take from me. No.... doesn't put me ion the best of moods. On this set of heads,I reached a new personal best for Iron XL, with the intakes flowing 259 cfm at .600" valve lift (@28 inch test pressure). That also happens to be the same cfm that the dedicated manifold that I use for Shovel/XL heads on the flow bench is capable of flowing by itself. In other words, the heads have reached the flow limit of the manifold testing through said manifold. Not too shabby! If I am not mistaken, that adds up to three porting "milestones" for 2009. Earlier in the year I reached the same results on Shovelheads, with the heads flowing as much through the manifold as the manifold will flow alone. 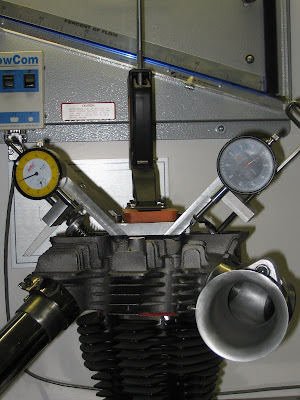 The third was reaching 300 cfm on a set of '06 and later stock Twin Cam head castings (304cfm @ .600 lift to be exact). Looking back at these accomplishments managed to take the sting out the Government waste that is our tax system. Well, ....at least temporarily.